“Mechanics (the study of forces and their effects) when applied to humans, is called biomechanics”. Positioned below the thoracic spine, the lumbar spine normally has 5 vertebrae, while the sacrum consists of a series of usually 5 fused sacral vertebrae. Together this lower portion of the vertebral column (see below) is referred to as the lumbosacral spine and is an important biomechanical region of the body. As with all vertebrae in the body, the lumbar and sacral vertebrae consist of a “body” anteriorly which is larger and more cylindrical in the lumbar region and a “vertebral arch” posteriorly which encloses the vertebral foramen protecting the neural tissues. 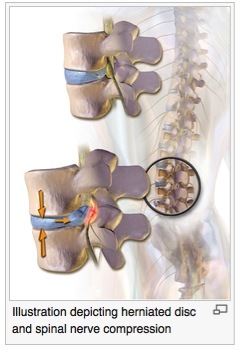 The vertebrae within the lumbar spine are separated by intervertebral joints which are unique articular structures, The intervertebral discs are the joint’s key component, made up of distinct features. The central paste-like nucleus pulposus consists primarily of water (70-90%) and hydrostatic proteoglycans (65% of the dry weight) loosely bound by collagen fibres (15-20% of the dry weight). The nucleus is surrounded by the strong concentric collagen layers of the annulus fibrosis consisting of water (60-70%), collagen (50-60% of the dry weight) and proteoglycans (20% of the dry weight) which are mostly aggregated. The nucleus and annulus both contain type II collagen throughout and the outer annulus contains a higher concentration of type I collagen. Elastic fibres (10%) are also found in the annulus and are arranged circularly, obliquely and vertically, with a concentration towards the attachment sites with the vertebral endplates. The vertebral endplate covers the upper and lower aspects of the disc and is strongly joined with fibrocartilage to the nuclear and annular parts of the disc. There is a greater concentration of collagen in the tissue nearer the bone. The lumbosacral transition is normally at the level of L5/S1 and the intervertebral disc at this level is wedge shaped. A “transitional vertebra” is a spinal anomaly where the lowest lumbar vertebra is to a degree fused or a failed segment of the sacrum thought to occur in 4-30% of the population. The sacrum is a triangular wedge-shaped bone with a concave anterior aspect, a convex dorsal aspect and an apex. The sacrum is tilted forward so that the upper surface articulates with the L5 vertebra above contributing to the “lumbosacral angle”. The intervertebral disc L4/5 and L5/S1 along with the vertebral body L5 account for nearly 60% of the angular measurement of lumbosacral curvature, averaging 61 degrees. On the anterior surface of the sacrum the superior and inferior edges of the fused vertebral bodies correspond as transverse ridges. The scarum provides strength and stability to the pelvis and transmits forces to the pelvic girdle via the sacroiliac joints. The sacral vertebrae are connected to the coccyx inferiorly. The 3 movements in the spine are flexion, extension, rotation and lateral flexion. These movements occur as a combination of rotation and translation in the following 3 planes of motion: sagittal, coronal and horizontal. These movements result in various forces acting on the lumbar spine and sacrum: compressive force, tensile force, shear force, bending moment and torsional moment. For example, with lumbar flexion, a compressive force is applied to the anterior aspect of the disc and a distractive force is applied to the posterior aspect of the disc. The opposite forces occur with lumbar extension. The lumbar spine complex forms an effective load-bearing system. When a load is applied externally to the vertebral column, it produces stresses to the stiff vertebral body and the relatively elastic disc, causing strains to be produced more easily in the disc. Pressure within the nucleus pulposus is greater than zero, even at rest, providing a “preload” mechanism allowing for greater resistance to applied forces. Hydrostatic pressure increases within the intervertebral disc resulting in an outward pressure towards the vertebral endplates resulting in bulging of the annulus fibrosis and tensile forces within the concentric annular fibres. This transmission of forces effectively slows the application of pressure onto the adjacent vertebra, acting as a shock absorber. The intervertebral discs are therefore an essential biomechanical feature, effectively acting as a fibrocartilage “cushion” transmitting force between adjacent vertebrae during spinal movement. The lumbar disc is more predisposed to injury compared with other spinal regions due to: the annular fibres being in a more parallel arrangement and thinner posteriorly compared with anteriorly, the nucleus being positioned more posteriorly, and the holes in the cartilaginous endplates. When a load is applied along the spine, “shear” forces occur parallel to the intervertebral disc as the compression of the nucleus results in a lateral bulging of the annulus. Shear forces also occur as one vertebra moves, for example, forwards or backwards with respect to an adjacent vertebra with flexion and extension. Torsional stresses result from the external forces about the axis of twist and occur in the intervertebral disc with activity such as twisting of the spine. The zygapophysial or “facet” joints provide stability to the intervertebral joint with respect to shear forces, whilst allowing primarily flexion and extension movement. The degenerative disc changes associated with aging have been considered normal. For example, the concentration levels of proteoglycans within the nucleus reduces with age, from 65% at early adulthood to 30% at the age of 60, corresponding to a reduction in nuclear hydration and concentration of elastic annular fibres over this time, resulting in a less resilient disc. Narrowing of the disc with age has long been considered, however large post-mortem studies indicate that the dimensions of the disc actually increase between the 2nd and 7th decades. Apparent disc narrowing may otherwise be considered a result of a process other than aging. There are also reductions in vertebral endplate nutrition and vertebral body bone density levels. The reduction in support from the underlying bone results in “microfracture” and the migration of nuclear material into the vertebral body known as “Schmorl’s nodes”, usually seen in the thoracolumbar and thoracic spines and have a low incidence below the level of L2. The lumbar facet joint subchondral bone density increases until the age of 50 after which time it decreases, and the joint cartilage continues to thicken with age despite focal changes, particularly where shear forces during repeated flexion and extension are resisted. Other bony changes also occur at the facet joint including “osteophyte” and “wrap-around bumper” formation presumably due to repeated stress at the superior and inferior articular process regions respectively. The processes of degeneration have also been considered as pathological. With respect to the facet joints “osteoarthritis” and “degenerative joint disease” are common diagnoses. 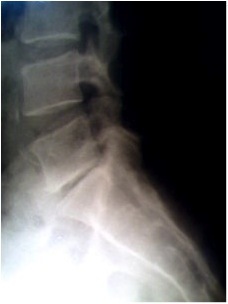 “Spondylosis” and “intervertebral osteochondrosis” are also terms used to describe degenerative changes at the sites of the vertebrae and neural foraminae. “Degenerative disc disease” and are also common diagnoses. Stage 1: “Early degeneration” involves increased laxity of the facet joints, fibrillation of the articular cartilage and intervertebral discs display grade 1-2 degenerative changes. Stage 2: “Lumbar instability” at the effected level(s) develops due to laxity of the facet capsules, cartilage degeneration and grade 2-3 degenerative disc disease. Segmental Instability: may be defined as loss of motion and segmental stiffness such that force application to that motion segment will produce greater displacements than would occur in a normal structure. 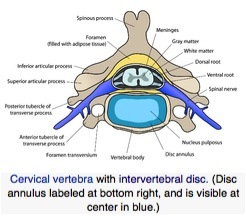 Mechanical testing suggests the intervertebral disc is most susceptible to herniation at this stage. Stage 3: “Fixed deformity” results from repair processes such as facet and peridiscal osteophytes effectively stabilising the motion segment. There is advanced facet joint degeneration (or “facet joint syndrome”) and grade 3-4 disc degeneration. Of clinical importance is altered spinal canal dimensions due to fixed deformity and osteophyte formation. Importantly, the incidence of spondylosis and osteoarthritis are the same in patients with symptoms and without symptoms, raising the question of whether these conditions should always be viewed as pathological diagnoses. This has clinical implications particularly with respect to interpretation of radiological investigation findings, and how results are presented to and discussed with patients. ↑ 1.0 1.1 1.2 1.3 Jensen M Biomechanics of the lumbar intervertebral disk: a review. Physical Therapy. 1980; 60(6):765-773. ↑ 3.0 3.1 3.2 3.3 3.4 3.5 3.6 Bogduk, N. (2012). Radiological and Clinical Anatomy of the Lumbar Spine (5th ed.). China: Churchill Livingstone. ↑ McKenzie, R. (1981). The lumbar spine : mechanical diagnosis and therapy. Waikanae, New Zealand: Spinal Publications. ↑ White A, Panjabi M. Clinical Biomechanics of the Spine. 1978, Philadelphia: JB Lippincott Co.